When I get back home I feel like I need to power off and restart in order to fully log all the new information gathered. Life on a farm near Raleigh is vastly different than life IN Raleigh. On the farm there is time to stop and feel the warmth of the sun on a cool spring afternoon. There is quiet to hear the details in the beckoning calls of male birds swooping about. The ability to focus on the details of grass types or sprouting seeds comes more easily. I feel there is more perspective available on the farm. That day filled with rain isn’t a bummer, it is a welcomed gift to help the land spring forth in abundance. The fact that my cell phone signal is beyond weak is a reprieve from doing business related task as I tend to farm work outside. The lack of community sponsored activities for my kids means they are more appreciative of gatherings and have more time to learn on their own. 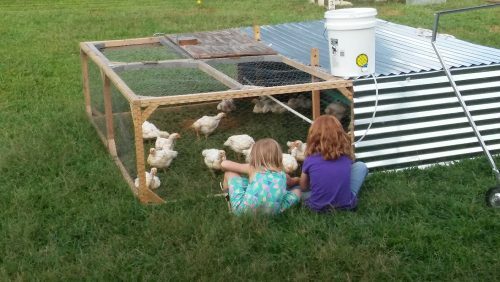 Two young girls tending pastured chickens in a field. Life on a farm near Raleigh isn’t for everyone just as life in Raleigh isn’t for me. The most wondrous fact in our differences is that it makes us need each other. We need our Raleigh community to support us by buying local and investing in small family farms. And Raleigh needs the small family farms to help them reconnect to their food. They need the ability to buy food that won’t make them sick but will help heal them and the land. Together the “near Raleigh” folks and the “in Raleigh” folks can make a positive difference for our health, the health of the land, and the health of our community as a whole. Lets reconnect Raleigh, North Carolina to food and farmer! Click here is see where you can find us in our community.